Our purpose is to assist pastors, missionaries, and churches in fulfilling the great commission. All our activities and resources are aimed at preaching the Gospel to the lost, equipping the saints to do the work of the ministry, and encouraging and assisting God's servants. Spiritual Success Institute is a non-profit religious organization incorporated in the state of South Carolina with a tax exempt status from the I.R.S. We are Baptist in doctrine, and we are supported by interested individuals and churches. Our home church is Hampton Park Baptist Church in Greenville, SC. Evangelist Ron Hood accepted Jesus Christ as personal Savior as a result of reading the Bible and gospel tracts while in the U. S. Navy in October 1962. Two years later, after being honorably discharged from the Navy, he enrolled at Bob Jones University in Greenville, SC. He earned a B.A. in 1968 and a M.A. in 1971 from BJU. He met Barbara while serving the Lord at the Newport, Rhode Island Servicemen's Center in the summer of 1967. They were married August 5, 1968. Ron and Barbara served the Lord at Southland Bible Institute in Pikeville, Kentucky from 1971 to 1973. During that time, Ron traveled and preached frequently promoting the school. God used that experience to lead him into full-time evangelism. In 1974, Ron and Barbara wrote and published the book, How to Successfully Memorize and Review Scripture. God has used that book and the method of scripture memory that Ron developed to strengthen and change the lives of thousands of Christians in the U.S. and several other countries. From 1974 to 1985, the Hood family traveled across the U. S. and had a full schedule of meetings in churches and Christian schools. The family sang and quoted Scripture in each service. Ron preached for revival meetings, family-life conferences, and soul-winning conferences. 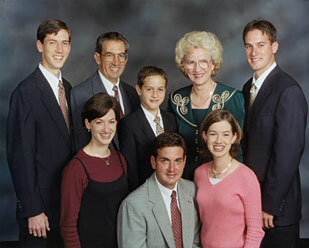 Since 1986, the Hood family's ministry has been primarily in the Caribbean. They have had special services with music and gospel preaching in 564 public and private schools in Trinidad, Jamaica, Bahamas, Barbados, and St. Lucia. Ron continues to preach in churches and schools in the U. S. regularly. James has been preaching since 1995, and is also serving the Lord as an evangelist. Click here for more information about James and his wife Suzanne. Mission work -- We minister in 25 to 45 public schools in Jamaica and other Caribbean islands each year. We also minister in churches and help missionaries as much as possible while there. Radio ministry -- We are on the Harbour Light of the Windwards at 6:30 a.m. and 4:30p.m. Monday through Friday. We are on the Caribbean Radio Lighthouse at 6:35 a.m. Monday -Friday. Church ministry -- We go to churches for one service or one day and teach people how to memorize Scripture. Ron Hood conducts a health seminar in churches. He also gives series of messages on the family and finances and speaks in mission conferences. Ron Hood and his son, James, conduct revival meetings and soul winning conferences, and they speak in school chapels. Bible Correspondence course -- We offer a free Bible correspondence course through the mail. You may see one of the lessons, view the titles of the lessons in each course, or enroll in the course now. Show me more! Most of the materials deal with Scripture memory, but we also have helpful materials on family living and A Handbook on Health. Scripture memory materials -- These materials have been used of God to help many people in their personal lives, families, and ministries. How to have a personal relationship with God -- You may read or request a free copy of Fellowship With God. This colorful 32-page booklet has Scripture and diagrams that explain how you can have your sins forgiven and enjoy fellowship with God now and throughout eternity. Click the title to view or read it now. Bible on cassette tape -- We offer the Bible on cassette tape (KJV), read by Alexander Scourby. You may order the New Testament or the Old Testament. Dramatized Bible Stories -- These thirty-minute stories on cassette tape are suitable for all ages. They are produced by professional actors and are rich with sound effects. Health -- A Handbook on Health is a 128-page book by Ron Hood that teaches natural ways to lose weight, lower blood pressure, and increase energy without pain, pills, physicians, or prescriptions. This book is written from a Biblical perspective and is based on research from twenty-nine other sources. You can view most of these materials, get detailed information about each item, and order items in our online store. For more information about our materials and testimonies of how they have helped others go to our catalog page. You may read or request a free copy of Fellowship With God. Click the title to view or read this 32-page booklet.